Myelopathy: gradual loss of nerve function due to disorders of spine. Myelopathy refers to the condition in which the patient suffers from a gradual loss of nerve function due to disorders of spine. It can be due to a functional disturbance or pathological change in the spinal cord. This disorder is caused by damage or injury to the spinal cord. 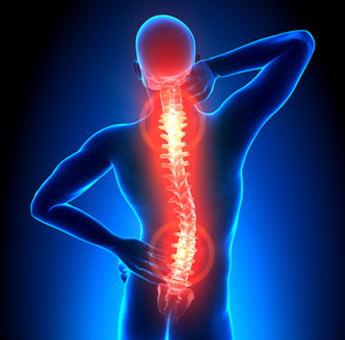 An injury to the spine can cause either paralysis or reduce sensation. The most common cause of myelopathy is spinal stenosis, which is a gradual narrowing of the spinal canal. Spinal stenosis makes the space available for the spinal cord within the spinal canal much smaller. The bone spurs begin to press on the spinal cord and the nerve roots, and the pressure may start to interfere with the normal function of spinal nerves. Myelopathy can also be caused by degenerative disc disease. Patients with degenerative disc disease may experience varied degrees of loss in sensation and movement. Myelopathy is usually first detected as difficulty in walking due to generalized weakness. Difficulty in walking due to problems with balance and coordination is also an important symptom of myelopathy. The gait may also become wobbly. This condition is diagnosed by studying the patient's medical history. The doctor will begin by asking the patient about the history of how the symptoms began and how they progressed. The doctor will ask a series of questions and carry out a physical examination that is directed primarily at the neck and nerve function in the arms and legs. The doctor will also check the balance and test the gait of the patient. The doctor may request for X-rays to see signs of degenerative changes in the disc spaces or facet joints. The doctor may also order Magnetic Resonance Imaging of the neck. MRI pictures will allow them to visualize the structures which may be impinging on the spinal cord or the nerve branches. Electrical testing of the nerves and spinal cord may also be requested. Treatment for advanced cases of myelopathy is surgery to decompress the spine. The goal of this surgery is to slow down or reduce the pressure on nerve roots. Unfortunately, this surgery can not guarantee relief. Another problem is that spine surgery is usually very complicated. In the elderly, the risks may outweigh the benefits. For mild cases of myelopathy, the best course is usually pain management. Less serious cases can also be treated with a certain home remedies, such as a hot shower or over-the-counter medications and devices. Some non-steroidal anti-inflammatory drugs like ibuprofen can also be helpful. Serious complications in myelopathy can be devastating. They can affect all functions of human body and can cause paralysis. Patients may loss their ability to walk, use their arms, or may even loss control of breathing. If preventive measures are not taken, this disorder may result in a further aggravated condition. This material is intended to give the patient an overview of surgical procedures and treatments and is not intended to replace the advice and guidance of a physician. Always consult with your doctor about the particular risks and benefits of your treatment.